Come to the richness, come to the purest. 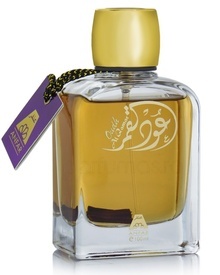 Khulasat al Oud is designed for those lovers of pure oud. Precious. Pure. Profound. This glorious rich combination is fashioned with the symphony of flowers. The toughness of wood is floating on the subdued freshness of rosy, citrus & incense notes, bounced with the sharp base notes of labdanum & musk. Un parfum unicat. mirosul este incredibil. Wow , super parfum !